What do you know about evaporative coolers? How do you choose a suitable one for you? With the high temperatures in summer and dry climates in the Middle East, Air Conditions became one of the important electric appliances to have at home. However, air conditions are not suitable for everyone in the region because of our dry climate and since they rely on high compressors and have an expensive price. Therefore, there are other types of coolers that are more suitable for these regions which are Evaporative coolers (cooling systems that use water vapor). Even though traditional air conditions and evaporative coolers have the same main purpose of cooling the surroundings, each have a different mechanism. 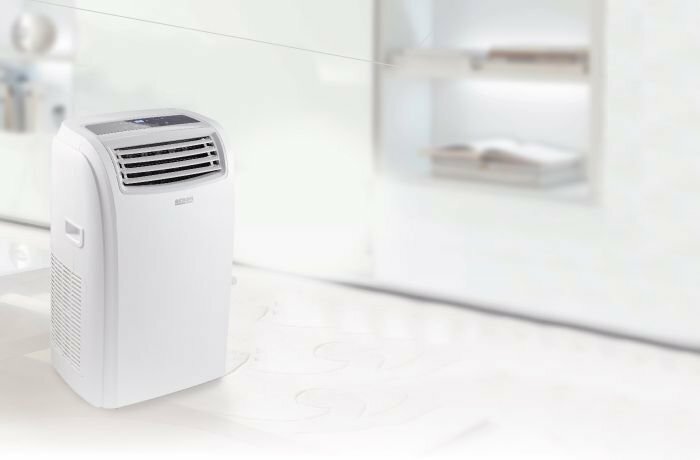 In this article, we will explain the mechanism of an evaporative cooler, where it is best used, and how to choose the best one. Traditional split air conditions rely on compressors to exert pressure on the cooling gas and then expanding it. Gas expansion leads to absorbing the heat from the area and cooling it inside. This complex mechanism requires expensive tools that need to be installed by experts. On the other hand, the evaporative cooler has a very simple and natural mechanism similar to how our body cools itself. This mechanism is known as evaporation. It is mainly based on how liquids (water) absorb heat from the area and turns it to vapor making the surroundings cooler. This is similar to how our body sweats which helps cool us. It can be seen after swimming where the breeze gives a cool feeling even if it is warm and dry since the skin is wet and moist. An evaporative cooler is made from two special sets of fans. The first draws warm air in while the second one releases cool air. Between those two sets, the cooler has sponge-like objects that are moist. Passing the dry air through them leads to its evaporation. Thus a cool and moist air will be released into the room. Is the Evaporative Cooler Suitable for you? Humidity Level: Since evaporative coolers depend on the evaporative water to cool the air, low humidity and desert climate is suitable for them. The dry air can withstand humidity and so is more effectively cooled. Tropical and continental climates make it harder on evaporative coolers to do their task since they are less effective at evaporating the air. Any area with more than 50% humidity level is not suitable for evaporative coolers. Maintenance: Evaporative coolers require high continuous maintenance as water needs to be checked regularly. They also need to be cleaned periodically and changing the sponges water. When left without use, there is a special process that needs to be done; the sponges need to be dried and disconnected from electricity. Opening Windows: There is a high level of humid air when an evaporative cooler is used (as it depends on water vapor). It is important to open a crack in windows when it is used to allow excess humidity to exit to avoid troubled breathing. High humidity can also ruin wooden furniture which expands when absorbing liquefied air. Therefore, they can be damaged after long periods. Air Filtration: When compared to compressor ACs, evaporative coolers do not have highly efficient filtration systems. Even though they can mildly purify the air, their performance cannot be compared to the advanced purifiers used in ACs. 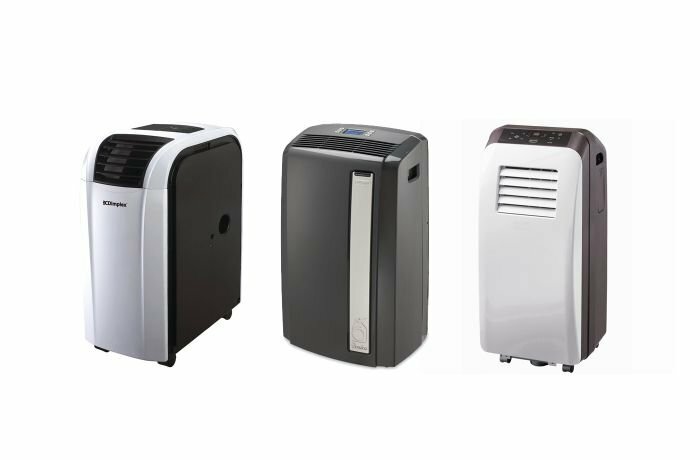 How to Choose an Evaporative Cooler for you? Purchasing an evaporative cooler is not an easy decision as there are many different brands, types, sizes, shapes, and features. We will now list the important factors that will help you limit your options to make the best one. Unlike compressor ACs, the number that represents the evaporative cooler’s capacity measured in BTU (British thermal unit) is not really accurate. The more accurate unit is CFM which stands for Cubic feet per minute. This unit represents the speed at which the air passes and not the cooling capacity (the cooling capacity differs according to the humidity level in the air). CFM unit can be rounded to tons for cooling. One cooling ton equals 400 CFM is optimal conditions. But this value differs with the humidity level. The cooling effort decreases with high air speed. There are two main types of evaporative coolers. The first is portable and can be easily moved from one place to another. It is can be used and moved easily making it more flexible for people who want to take it to different rooms. The second type is still and is installed on windows. Even though it cannot be moved, it is suitable for small homes that do not have enough space. It is also useful when you only need to cool one specific room. All types of evaporative cooler need continuous maintenance but not at the same rate. Some need more maintenance than others. This factor may not be important to everyone, but you have to keep in mind that there are some that do not need continuous maintenance which will save you time and effort on the long run. One of the disadvantages of evaporative coolers is not being able to automatically control the temperature. In some types, the user will need to manually adjust the temperature while in other types the temperature can be set automatically according to their preference. Another disadvantage of evaporative coolers is their noise which can reach 60 disciples (the average level of noise). Usually, the brand and price affect this factor. Cheaper evaporative coolers have a high noise, and as the price and quality increases the noise decreases. Since noise can be irritating and can affect sleep and daily activities, it is better to get a quitter type if you can afford it. After explaining the mechanism and the factors and specifications of evaporative cooling machines, we will now list the important advices for you to keep in mind when purchasing one. Purchase an evaporative cooling machine only if you are in a dry climate. If you live in a high humidity area, then this type of cooling machines will not benefit you, but will be a liability instead (especially when it comes to power consumption). Buy an evaporative cooler with good filtration options. Air filtration is very important especially in cities. Cars produce a lot of smoke and impurities, and having a good filtration system will minimize the risks. Invest in a good type. Air cooling systems are a long term investment, and on the long run, having an expensive cooler will be more economic than buying a cheap one (as it will be damaged and need fixing regularly). Check humidity options. Even though humidity is desired in dry climates, high levels of it can cause health problems and also damage wooden furniture. Finally, it is important to think rationally and search thoroughly before buying a condition since there are many factors that affect your choice. Read reviews and buying tips to ensure making a smart and wise decision.